On February 10th 2007, as volunteer Carolina Kunnen setoff to Ghana to establish the first project of The Optical Foundation. Fellow board member Huub Villevoye accompanied her for first two weeks, so they could work on the initial setup together. Huub and Carolina travelled to Cape Coast, a coastal town about 3 hours west of Accra. 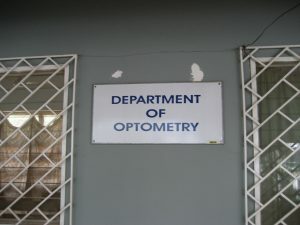 They had heard that the university at Cape Coast was offering a course in optometry, however, since they had had no luck getting in contact with the director of the program prior to their departure for Ghana, Huub and Carolina journeyed to the university on spec. At the university they were warmly welcomed by Dr Owusu – the director of the optometry course. He was very enthusiastic about the plans of The Optical Foundation and promised full cooperation. He also introduced them to Dr. Godwin Ovenseri-Ogbomo, one of the lecturers of the course. After Huub left, Carolina started lecturing at the University of Cape Coast while she was waiting for the equipment to arrive in Ghana. Carolina helped with the practical classes of the third year students and gave orthopic classes to the fourth year students. Carolina teaching orthopics was a godsend as the lecturer of this course had left half way through the course never to return and without being able to finish this course those students wouldn’t have been able to proceed to the next year. After all preparations, the point had finally been reached where eye exams could start and on Monday, June 4th, 2007 the ‘Glasshopper’ project was launched. The exams were organised as follows: In the morning Carolina would go with an average of 10 optometry students to a primary school and would screen approximately one class a day. These primary schools are attended by children of the poorest communities in Ghana, comprising of an average of 40 to 50 students per class. Each child was given an extensive eye examination, performed entirely by one student. In doing this, the students get to learn how to do a full examination and how to start thinking about the diagnosis, all while getting a real sense of responsibility towards the patient’s treatment plan. 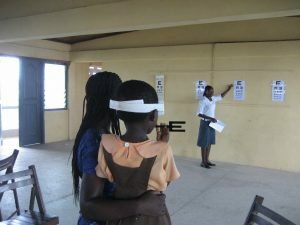 In addition to the comprehensive eye exams at primary schools, Carolina organised for her team of students to also provide comprehensive eye exams for street children in Cape Coast. These screenings were performed at the Cape Coast Castle. This castle, which in the past was used for the slavery trade, is now a museum to remember this despicable chapter of Ghana´s history. It is also used as library and clean water collection point, making it a place dedicated to the service of the local community, so the proposal of The Optical Foundation to hold comprehensive eye exams for street children at the castle was warmly welcomed. During the screenings in 2007, we examined close to 1,000 children and approximately 150 teachers. Of the 961 children examined, 71% were female and 29% male. The high rate of females is because the first school we visited was an all girl school. The age of the children examined, ranged from 1 to 19 years old. Only 6 of the 961 children had previously had an eye examination or already wore glasses. This while 55% of children were found to have an eye disorder. However, not all of these eye disorders need to be corrected with spectacles, because with young children the eyes are still developing and certain eye conditions are seen as normal. Aside from this, 60 children were referred to an ophthalmologist for ophthalmic treatment, or if there was a prognosis of a potential eye disease in the future, they were referred to the eye clinic of the University of Cape Coast. In seven of the 961 children a lazy eye was diagnosed. If it wasn’t already too late, a treatment to correct the lazy eye was started for these children, who remain under treatment of University of Cape Coast´s eye clinic. 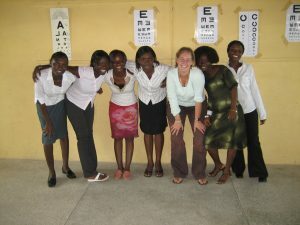 During this period, Carolina not only examined and helped many children, but also trained and provided practical experience to 35 Ghanaian optometry students. Students who joined the eye testing had clearly grown from the experience and their knowledge had expanded significantly. Educating the local population on the importance of eye care and training students to become specialists in their own country, is one of the main priorities of The Optical Foundation. The aim is for these local future specialists to eventually take ownership this project and focus on the eye care in their own country. Carolina also took the initiative to put together an all female screening team to empower these women, with the aim of trying to break the cycle of the gender hierarchy bias. The figures show that our work is desperately needed. Dr Godwin and Carolina published the results of the comprehensive eye exams in the Dutch optometrists trade journal’Visus’ (2/2009, page 10-13). Through publications, we try to make the Ghanaian government aware of the need for eye screenings for Ghanaian children. A 10 year old had an eye disorder of -9.00. Without glasses she could see 1% and with her glasses her vision improved to 35%. Because of not having glasses over the years, her eyes were never able to fully develop and she will never see have more than 35% vision. A girl of twelve required a corrective strength of +8.00. Her eyes were also never able to fully develop and she will never have more than 60% vision. A timid and shy 13 years old girl had an untreated lazy right eye, with at most 40% vision for which no more improvement could be achieved. Her left eye required -3.00.